CliffsNotes AP U.S. Government Cram Plan gives you a study plan leading up to your AP exam no matter if you have two months, one month, or even one week left to review before the exam! 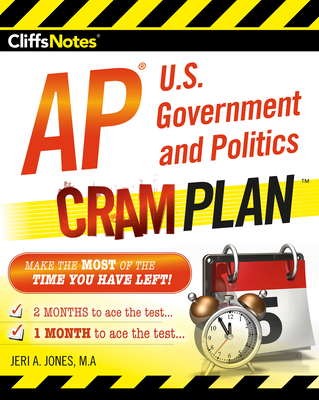 This new edition of CliffsNotes AP U.S. Government and Politics Cram Plan calendarizes a study plan for the 214,000 annual AP U.S. Government test-takers depending on how much time they have left before they take the May exam. Jeri A. Jones, M.A., delivered secondary instruction in the Los Angeles Unified School District for 33 years, the last 14 of those teaching AP U.S. History and AP U.S. Government and Politics at an urban medical magnet high school. She received special recognition from her school district as one of only five teachers to achieve a “highly qualified” distinction in all 15 categories of instructional performance (2013) and was also recognized by the City Council of Los Angeles for teaching excellence (2015). She resides in Coarsegold, CA. Lindsay Reeves holds advanced degrees in political science, women’s studies, and theology. She is an educational program specialist who has designed formative assessments, curriculum, and scoring for students taking the AP, Praxis, SAT, and LSAT exams. With nearly a decade of experience in education, Common Core Standards, and STEM, her work has been featured in a variety of publications and web-based articles. She resides in Athens, GA.